The WM615 wireless travel mouse from Dell is a stylish, high-precision wireless mouse with a long battery life. The wireless connection through Bluetooth 3.0 helps provide users with a clutter-free mouse solution that enables users to create workspaces while on the go. This mouse is designed for comfort to allow mobile users to work or play on their notebooks for long periods without the usual stress on the wrists or hands. This mouse is easy to set up through Bluetooth, allowing you to simply pair with your computer and get started right away. dimensions 1.2" x 2.3" x 4.6"
The WM615 Wireless Travel Mouse from Dell™ is a stylish, high-precision wireless mouse with a long battery life. The wireless connection through Bluetooth 3.0 helps provide users with a clutter-free mouse solution that enables users to create workspaces while on the go. This mouse is designed for comfort to allow mobile users to work or play on their notebooks for long periods without the usual stress on the wrists or hands. This mouse is easy to set up through Bluetooth 3.0, allowing you to simply pair with your computer and get started right away, with no software required. The compact size makes this mouse a great option for the mobile professional. This product has been tested and validated on Dell systems. The Dell Bluetooth® Mouse-WM615 combines high-performance with an innovative design which lets you transform from comfort to ultra portability and increase your productivity in virtually any setting. Easily shift from usage to portability by twisting the Dell Bluetooth® Mouse from the open shape that comfortably fits your hand when you're working, to the folded slim mode you can slide into your pocket. With a touch strip for precision scrolling, an infrared LED tracking sensor and smooth left and right click areas, the mouse puts accurate and reliable performance at your fingertips. Navigate quickly and work more productively with this high-performance and ultraportable mouse. Twist the Dell Bluetooth® Mouse into slim mode and take it with you to the office, your favorite coffee shop, home or on the road. Untwist the mouse and you'll be equipped to increase your work productivity wherever your on-the-go lifestyle takes you. Advanced Leading Bluetooth® SMART technology allows you to quickly and easily pair the mouse with Bluetooth 4.0-enabled computers and get to work. 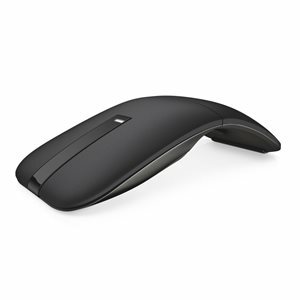 The Dell Bluetooth Mouse-WM615 is compatible with modern operating systems using Bluetooth 4.0 radio. With your comfort in mind, the Dell WM615 mouse has a curved shape designed to fit well in the palm of your hand. The touch strip and left and right click areas are positioned within easy reach that makes them seamless to use.